After leaving the Grandy Creek TT near Concrete, WA we drove a whopping 45 minutes to Swinomish Casino RV Park, just east of Anacortes, WA. Maybe we've just been lucky, but we have stayed at some very nice casino RV parks the past few years. The park is located behind the casino and overlooks Padilla Bay. The sites were a bit tighter beside your neighbor than we like, but the roads were paved and the sites were nicely graveled. All utilities worked fine and internet reception (through our Verizon phones) worked great. As an added bonus, diesel at the Chevron station (near the front of the casino) was one of the lowest priced in the entire area. Okay, so much for the infrastructure. We were here to explore the area. We haven't stayed near the water in a bit and we wanted to get out and explore. One day we took a drive in to Anacortes and visited Cap Sante Park. The park is located on a hill which overlooks Fidalgo Bay. From the high vantage point, you can sit and reflect and watch the boats heading into and out of Cap Sante Marina. Here's one of the whale sightseeing boats returning to port. A short distance away is Washington Park. This was a beautiful park to drive, or hike through, or simply to sit under the huge old-growth trees and watch the water. Here's the Anacortes-Orcas Island Ferry heading away from Anacortes. Many trails lead down to the waterline. That water is pretty darn cold, too. He we are on the south side of the park looking out towards Burrows Pass. 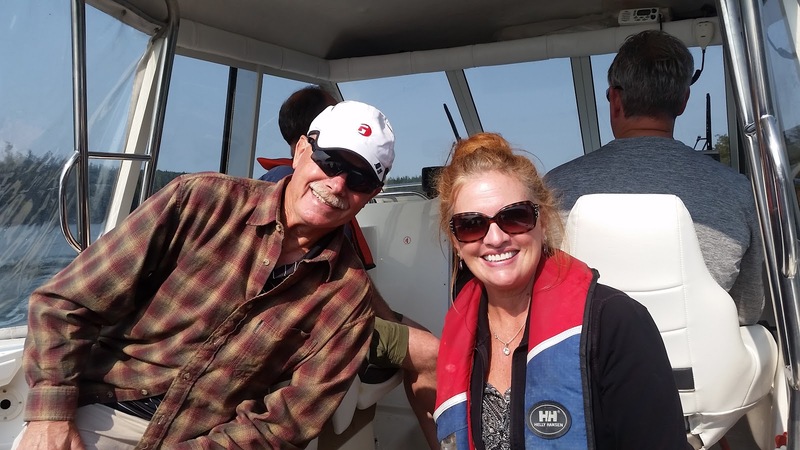 On another day, we were invited by Debi and Bill to Debi's sister's house for some great seafood and a chance to view the area from the water. Cherie (Debi's sister) and her husband James live right on the water at Miller Bay, which is a short ride via water to the Deception Pass Bridge. 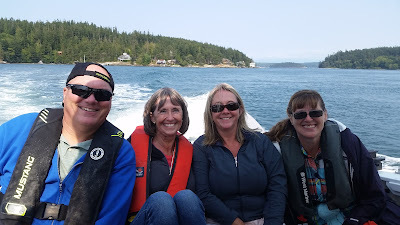 James and Cherie have a boat which allowed us to take a pre-dinner boat ride up through Deception Pass. The water current is very swift in this area. Bill and Karen seemed to be enjoying the ride on a beautiful afternoon. Unfortunately, I didn't have my camera with me to photograph the dungeness crabs which James (and Debi) pulled from crab pots just prior to dinner. WOW, it doesn't get any fresher than that! Along with the crabs, James cooked up some very fresh Sockeye salmon. It's definitely not a stretch to say that we enjoyed both the seafood and more importantly, the gracious company provided by Cherie and James. THANK YOU AGAIN DEBI for the invitation to meet them! 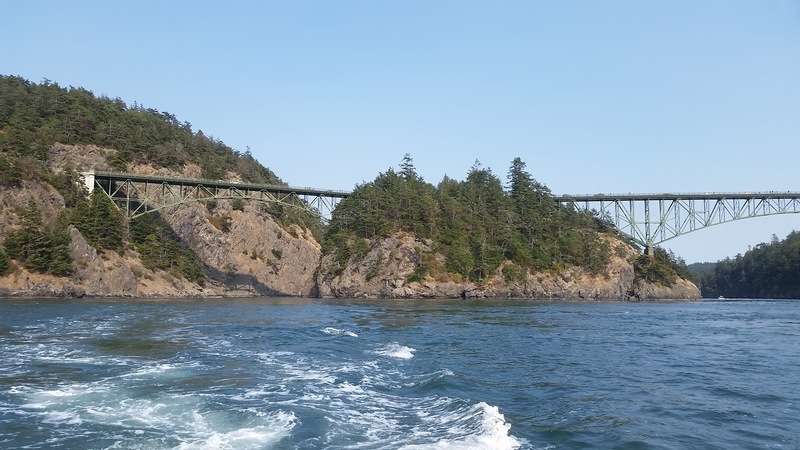 Of course, no visit to this area would be complete without a trip to Deception Pass State Park. We picked up tips from Cherie on what to visit while here. In one part of the park is an interpretive center devoted to the Civilian Conservation Corp (CCC). The CCC, as most already know, were responsible for building much of the infrastructure in the parks we enjoy today, especially in this part of the country. The building was originally a bath house for the beach nearby. They did a nice job inside of creating displays which depicted the life of the typical CCC worker. Afterwards we hiked Lighthouse Point Trail which began near the interpretive center and followed the perimeter of Lighthouse Point. The trail provided several opportunities to view the Deception Pass Bridge from various angles. 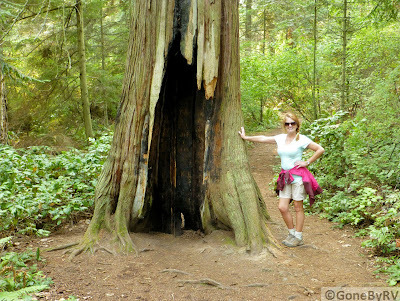 As the trail moves away from the rim, you are hiking thru large old-growth trees. Here's one that has survived a fire. As I mentioned earlier, the currents are very strong in the area beneath the bridge. A huge volume of water is moved because of the tidal water flowing through a relatively narrow opening. Here's a look at the underside of the bridge from the north shore. We rate Deception Park Pass as a "must see" for anyone visiting the area. The entire Anacortes area was a wonderful change from some of the mountainous areas we've stayed in recently. I've really moved thru our stay in this area quickly, because I'm so far behind in our blogging. Please click on the picture links near the beginning of this blog to view MANY pictures not included in today's blog. In the next blog, we move a few hours south to Graham, WA and have some great visits with Bill and Debi. Thanks again for stopping by to take a look! It just boggles my mind how much the CCC accomplished during its existence and most of it was done by hand. How much poorer we'd be today without all the work the CCC did. Nice to see a display about the workers life. Paul I was thinking the same thing as we viewed the displays of the CCC camp and workers. They built structures all over the US. I just know you'll be back to visit! Used to live on Whidbey Island. Add a drive up Mt. Erie (near Anacortes) for the views and Ft. Casey & Coupeville (on Whidbey) to your return trip plans :) You'll thank me later. I'm sure we'll be back, also. We enjoyed our nearly 2-month stay in Washington State very much.